Production: Columbia Pictures Corp.; black and white, 35mm; running time: 86 minutes. Released 10 June 1948. Filmed for the most part in fall 1946, in Central Park and the Maritime Union Headquarters, New York; the Aquarium and the Chinese Mandarin Theatre, San Francisco; the Walhalla Bar and Cafe, Sausalito; various locations in Acapulco; and aboard the yacht "Zaca" owned by Errol Flynn. Producers: Orson Welles with Richard Wilson and William Castle; screenplay: Orson Welles, from the novel Before I Die by Sherwood King; photography: Charles Lawton, Jr; editor: Viola Lawrence; sound: Lodge Cunningham; art director: Stephen Goosson and Sturges Carne; music: Heinz Roemheld; special mirror effects: Lawrence Butler; costume designer: Jean Louis. Cast: Rita Hayworth ( Elsa Bannister ); Orson Welles ( Michael O'Hara ); Everett Sloane ( Arthur Bannister ); Glenn Anders ( George Grisby ); Ted de Corsia ( Sidney Broome ); Erskine Sanford ( Judge ); Gus Schilling ( Goldie ); Carl Frank ( District attorney ); Louis Merrill ( Jake ); Evelyn Ellis ( Bessie ); Harry Shannon ( Cab driver ); Wong Show Chong ( Li ); Sam Nelson ( Yacht captain ). Bazin, André, Orson Welles , Paris, 1950; revised edition, Berkeley, 1979. Noble, Peter, The Fabulous Orson Welles , London, 1956. Cowie, Peter, The Cinema of Orson Welles , London 1965. Higham, Charles, The Films of Orson Welles , London, 1965. McBride, Joseph, Orson Welles , London, 1972; New York, 1977. Naremore, J., The Magic World of Orson Welles , New York, 1978. Andrew, Dudley, Film in the Aura of Art , Princeton, 1984. Weis, Elisabeth, and John Belton, editors, Film Sound; Theory and Practice , New York, 1985. Taylor, John Russell, Orson Welles, A Celebration , London, 1986. Bazin, Andre, Orson Welles: A Critical View , Venice, 1991. Welles, Orson, This Is Orson Welles , New York, 1993. Kaplan, E. Ann, Women in Film Noir , London, 1998. Taylor, John Russell, Orson Welles , New York, 1999. Pariante, Roberto "Orson Welles from Citizen Kane to Othello ," in Bianco e Nero (Rome), March 1956. Stanbrook, Alan, "The Heroes of Orson Welles," in Film (London), no. 28, 1962. Cowie, Peter, "Orson Welles," in Films and Filming (London), April 1961. "Welles Issue" of Image et Son (Paris), no. 139, 1961. "Welles Issue" of Cineforum (Venice), no. 19, 1962. "Welles Issue" of Etudes Cinématographiques (Paris), 1963. Interview with Everett Sloane, in Film (London), no. 37, 1965. Cobos, Juan, Miguel Rubio, and J. A. Pruneda, "A Trip to Don Quixoteland: Conversations with Orson Welles," in Cahiers du Cinema in English (New York), June 1966. Henderson, Brian, "The Long Take," in Film Comment (New York), Summer 1971. Goldfarb, Phyllis, "Orson Welles' Use of Sound," in Take One (Montreal), July-August 1971. Graham, M., "The Inaccessibility of The Lady from Shanghai ," in Film Criticism (Edinboro, Pennsylvania), Spring 1981. West, A., "A Textual Analysis of Lady from Shanghai ," in Enclitic (Minneapolis), Fall 1981-Spring 1982. Goldschmidt, D., in Cinématographe (Paris), February 1982. Houston, Beverle, "Power and Dis-Integration in the Films of Orson Welles," in Film Quarterly (Berkeley), Summer 1982. Albano, L., in Filmcritica (Florence), February 1985. Moilanen, H., "Aani & vimma, tasta maailmasta," in Filmihullu (Helsinki), no. 7–8, 1988. Naremore, James, "Between Works and Texts: Notes from the Welles Archive," in Persistence of Vision (Maspeth), no. 7, May 1989. Rampazzoni, Guido, "Cristallisation," in Vertigo (Paris), no. 6–7, 1991. Short review, in Revue du Cinéma (Paris), no. 470, April 1991. Schactman, K., in Scarlet Street (Glen Rock), no. 6, Spring 1992. McLean, A. L., "'It's Only That I Do What I Love and Love What I Do': Film Noir and the Musical Woman," in Cinema Journal (Austin), vol. 33, no. 1, 1993. Reid's Film Index (Wyong), no. 13, 1994. Rosenbaum, Jonathan, "The Battle Over Orson Welles," in Cineaste (New York), vol. 22, no. 3, December 1996. Tobin, Yann, "Près des yeux, près du coeur: Les gros plans de La Dame de Shanghai ," in Positif (Paris), no. 449–450, July-August 1998. 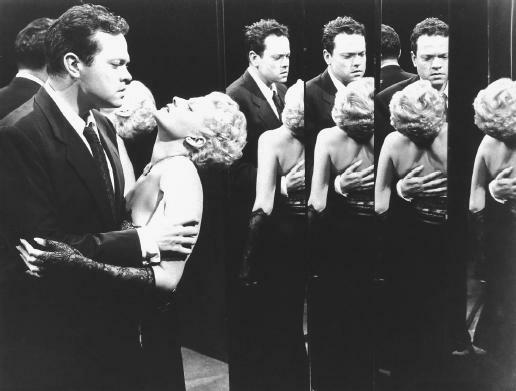 The Lady from Shanghai can be viewed as a variation on film noir . Set in Orson Welles's peculiar aesthetic and autobiographical mold, it acquires its own autonomy. It makes a self-conscious and intricate use of the frame, and its lush compositions in deep focus push together the foreground and background. The script appears to be written for the purpose of coordinating glaring ruptures breaking the synchrony of image and sound tracks that had prevailed in the studio tradition. The plot develops a play of human figures confined in a closed world of cross purposes. Michael O'Hara (Welles) is victimized in a skein of machinations wrought by Elsa Bannister (Hayworth) in collusion with and against her husband (Sloane), an aging, cane-swaggering cripple who happens to be a brilliant criminal lawyer. Framed by a set of fake self-murders, Welles portrays himself as a tough, soft-hearted, anti-Fascist refugee from the Spanish Civil War, an Irish innocent who adventures through life with resolution and independence. That he is a function of the others shatters his American dream of poetic self-identity. Simplicity and complication collapse in the mix of narrative and visual composition, the film ostensively unfolding not for its narrative but to threshold experiment in uncanny renderings of scenes that had become too standard in film noir . Characters are destined to meet and miss each other in what appear to be a photographer's retinal tricks. In the beginning, Welles encounters Hayworth during a carriage ride that is shot with vertical pans isolating and combining the two protagonists in two adjacent photograms. Later, they find themselves framed in backlit tableaux, notably in the sequence shot in the San Francisco aquarium. Close-ups of her sensuous profile and uncanny blonde—not red— chevelure are offset by lurid projections of monstrous fish, groupers swimming just behind Hayworth's face. Narrative turns into a mix of tourism, noir , and comedy. Obtained by the natural back lighting of the aquarium, Chiaroscuro makes Hayworth a playful figure of deceit, or a "phallic" female in a comic mode. Later, in the "Crazy House" of mirrors, the characters are multiplied prismatically as they seek to shoot their images to bits. "If I kill you, I kill myself," murmurs Bannister in close-up exactly where the frame places his reflection against Elsa's. Carnival ensues, bullets shattering mirrors until they finally reach the two spouses. A cinematic potlatch, the finale celebrates and consumes the entire film exactly where it comically displaces the tensions of the protagonist's fatal attraction for the woman who charms him. Relieved, and contrary to the hero of a noir scenario, the narrator slips away from the destruction and into the airy cityscape of San Francisco. "The only way to grow wise is to get old," he predicts, pacing off into the outdoors that eclipse him in light. High tonal contrasts produce images with razor-sharp outlines. On the one hand, the backlit decor yields chiaroscuro and indeterminate depth of field, while on the other, in the sequences shot off the California coast, the luminosity becomes a crucial element in the story. And Welles shoots from uncanny positions, in extreme tilts and countertilts, less predictable than those used in Citizen Kane , to obtain a total sense of disorientation. His camera establishes intimacy between forms at once in extreme closeup and in great depth. Shots of Hayworth on the rocks off Acapulco isolate her in such extreme depth of field that her body is barely recognizable next to O'Hara's nose in the foreground. As in Renoir or in Welles's earlier work, self-conscious use of optical instruments in the film-images reflected on the convex lenses of binoculars, water tumblers, anamorphic mirrors, windshields—tend to make the objects in frame theorize the visibility of the tale that is being told. And, as usual in the director's visual style, the play within the play mirrors the diegesis in mise-en-abyme . Just prior to the "Crazy House" sequence, Hayworth, who set about to "shanghai" O'Hara, leads the hero into a puppet show in a Chinese playhouse near Union Square. At that moment, in a sudden frenzy, he evades the police after being framed in a kangaroo trial. Elsa and the police seek O'Hara hidden among wizened Oriental spectators in a theater in Chinatown. Gongs and cymbals deafen the ear, dancers turn in stylized motion that signals patent melodrama; Elsa's blonde beauty, seen in closeup, matches her incomprehensible whispers murmured in the ears of her underworld cronies. The sequence doubles both the story and the visual style toward which the film had directed its play of narrative and visual form. In sum, the viewer is offered the pleasure of seeing cinema extended as neither the studio tradition nor film noir had yet done up to 1947. Welles works within an aesthetic matrix that had already stamped him as a foremost auteur in the movie industry, but his visual and narrative obsessions also inflect cinema in ways unknown up to that time. The film exceeds itself in other ways: it figures in a number of conventions but also works through Welles and Hayworth's own divorce that was taking place as they portrayed themselves in the production. Hayworth's blonde beauty emphasizes the travesty of both the narrative and visual style. The Lady from Shanghai cannot be easily classified. Its genre is its own and must be viewed independently of the high expectations that had been set for viewers since Citizen Kane or The Magnificent Ambersons .